Jalen Rose says 2014-15 Kentucky team "was John Wall and Boogie, right?" "That was John Wall and Boogie, right?" "I think so." "Yes, sir." Actually, Wall and Cousins played for Kentucky in the 2009-10 season, not 2014-15. It’s not just Stephen A. Smith making high–profile missteps on ESPN. 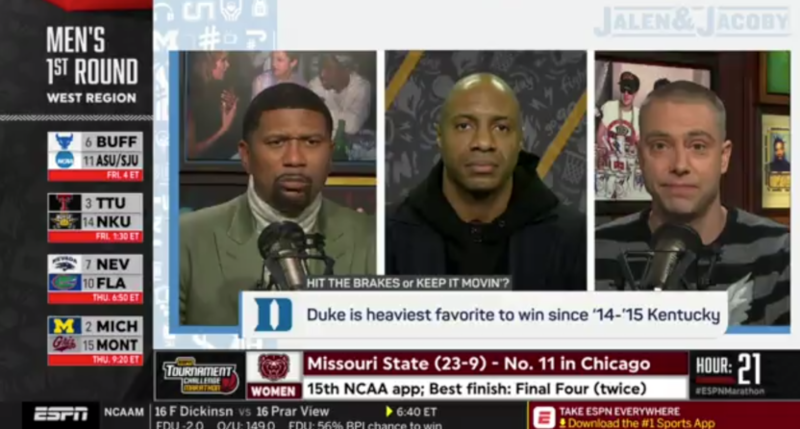 On Jalen and Jacoby Tuesday, Jalen Rose asked if the 2014-15 Kentucky Wildcats men’s basketball team was the one with John Wall and DeMarcus “Boogie” Cousins, and both David Jacoby and Jay Williams agreed it was. Kemba Walker was magical in that 2004 run. I’ll never forget Sean May in the 2009 tournament. Dominant. Apparently, this wasn’t the only questionable thing Williams said today either. Jalen Rose just compared Ja Morant to Lillard. Really good comp. Hadn't thought of that … Then Jay Williams called Bol Bol "a big guard." Which, at 7-3, might be a stretch. But hey, Rose has long been an admirer of Wall. That’s pretty good of Rose to “tell fools about Wall” two years before Wall supposedly played for Kentucky. Very prescient of him.